Are you just starting out at a new church and don’t know how to get plugged in? Have you been at your church for years and still haven’t found your place? Are you feeling disconnected, unhappy, or bored with your local congregation? Let me suggest you enter the “Plus One” program of church involvement. I don’t mean to sound like a bad infomercial. Here’s what I mean: In addition to the Sunday morning worship service, pick one thing in the life of your congregation and be very committed to it. The idea is simple. First, be faithful in attending the Sunday morning worship service. Don’t miss a Sunday. Sure, you may miss a couple Sundays during the year because of illness. Vacation and business travel may take you away from your local congregation several other Sundays too. But keep these to a minimum. Don’t plan all your cottage getaways over the weekend so that you miss out on your own church (and perhaps church altogether) for most of the summer. Don’t let the kids’ activities crowd out Sunday services. (What did Joshua say? “If soccer be god then serve soccer, but as for me and my household we will serve the Lord.” Something like that.) Don’t let homework or football or too much rain or too much sun keep you from the gathering of God’s people for worship. Commit right now that Sunday morning is immovable. You go to church. Period. Now, add one more thing. When you meet people who feel disconnected from church, start with this question: Are you committed to worshiping with us every Sunday unless you are providentially hindered? If they say yes, then move on to “Plus One.” Is there at least one other activity in the life of the church in which you are consistently and wholeheartedly participating? Usually the answer is no. Most people who feel disconnected from church feel that way because they have not made the effort to connect consistently. This doesn’t mean churches don’t have to do more to care for senior saints, singles, those with special needs, or any number of other folks in the church. This doesn’t mean pastors can say (or think), “It’s all your fault.” Sometimes it precisely the pastor’s fault. But I find that most often–not always, but normally–people who want to get involved, find a way to get involved through the existing structures of the church. That’s why I say, be faithful on Sunday morning, plus one more thing. Personally, I’m partial to the Sunday evening service. I think it’s the easiest, most historic, and one of the most biblical ways to really get to know your church. In most churches, the evening service (if they have one) is smaller, more informal, and contains elements of prayer and sharing that may not be as present on Sunday morning. Plus, the time after the service is usually less rushed and allows for more genuine fellowship. If Sunday evening is not an option, join a small group. (I reiterate: these are baby steps. I hope people in our church will participate in Sunday evenings and small groups.) If your church doesn’t have formal small groups, you could still invite a group of friends over every other week for prayer and fellowship. If that’s too much right off the bat, find a good Sunday school class and go every week. Or join the choir. Or get involved with the youth group. Or sign up to be a greeter. Or go on the men’s retreat. Or join the outreach committee. Or take the leadership training course. Or come to the prayer meeting each week. Or teach a kids class. Or volunteer with a local ministry your church supports. Or do Meals onWheels. Or join the softball team. Or do the mid-week Bible study. You get the idea. Large churches have hundreds of Plus One opportunities. Even small church will have plenty to choose from. Make Sunday morning your first priority. Then try one more thing and stick with it for at least six months. Maybe you’ll realize the church is not for you. Maybe you’ll still need help getting plugged in. Maybe you’ll find it’s time to sit down in person with a pastor or elder. But I suspect you will find that you feel more invested, you’ve made new friends, and you’re eager to see Plus One become Plus Two or Three. Kevin DeYoung has been the Senior Pastor at University Reformed Church since August 2004. His three main responsibilities include preaching, leadership, and administration. Kevin was born outside of Chicago in South Holland, Illinois and from third grade on, grew up in Jenison, Michigan. He attended Hope College and Gordon-Conwell Theological Seminary. Prior to serving at URC, Kevin was the Associate Pastor at First Reformed Church in Orange City, Iowa. Kevin and his lovely wife, Trisha, have six children: Ian, Jacob, Elizabeth, Paul, Mary and Benjamin. Sin nibbles at our soul in small steps. 1. Men enter and initiate themselves in a vicious practice by small sins. 2. Having once begun in the ways of sin, he ventures upon something great and more daring; his courage grows with his experience; and he gives himself more liberty to walk in the ways of his own heart, and the sight of his own eyes. 3. Open sins soon throw a man into the hands of ungodly companions. 4. In the next stage, the sinner begins to feel the force of habit and inveterate custom. 5. The next stage in a sinner’s course is to lose the sense of shame; and sin openly and boldly. 6. Another stage in the sinner’s progress is to harden himself so far, as to sin without remorse of conscience. 7. Improved sinners often come to boast and glory of their wickedness. It is something to be above shame; but it is more still to glory in wickedness and esteem it honorable. From small sins to bigger sins, to bad friends and bad habits, to loss of shame and loss of conscience, to boasting in what is evil and being zealous for others to do the same–that is the devilish nature of sin’s grip on the human heart. Was true in Scotland in the eighteenth century. Is true in America now. And everywhere else for that matter. For today’s on my shelf Monday I want to recommend a book that has helped me greatly. It is by Kevin DeYoung and Greg Gilbert, and it’s called What is the Mission of the Church: Making Sense of Social Justice, Shalom, and the Great Commission. Kevin DeYoung (MDiv, Gordon-Conwell Theological Seminary) is senior pastor at University Reformed Church in East Lansing, Michigan. He is the author of several popular books, including Just Do Something and Why We Love the Church. Greg Gilbert earned his BA from Yale and his MDiv from The Southern Baptist Theological Seminary. He is senior pastor at Third Avenue Baptist Church in Louisville, Kentucky, the author of What Is the Gospel? and the co-author of What Is the Mission of the Church? 100 Basic Bible Questions: Can You Answer These? Several years ago our church started offering a leadership training course once or twice a year. The class began as a training seminary for those who had been nominated for elders or deacons. Now the course must be completed before a man can be considered for the office of elder or deacon. At the end of the 12-week class there is a test. The exam contains a couple longer essays, short answers, and a series of questions testing basic Bible knowledge. We are careful to say that you don’t have to be a brilliant student to serve at University Reformed Church. There is much more to effective ministry than passing a written test. Much more. And yet, we do not want our staff, teachers, and officers to be biblically illiterate. Granted, people aren’t usually too excited about taking a test, but they are almost always glad to have taken the class. And more often than not, the test proves to be an edifying experience. For fun, and for your own evaluation and learning, I thought I’d post the questions that comprised the knowledge portion of the exam. We have changed the exam in recent years, so these are not the exact questions we currently use. (I’m not going to show everyone the test ahead of time!) But this will give you an idea of the sort of Bible knowledge we want our lay leaders to have. No one gets every question right, but most people get most of them right, and a few erudite members have nearly aced the thing. I have not provided below the answers to test, because, well, it’s a test. A. Who did the following? 1. Wrote the book of Acts? 2. Appeared with Jesus on the Mount of Transfiguration? 3. Directed the rebuilding of the wall of Jerusalem? 4. Killed a thousand Philistines with a donkey’s jawbone? 5. Led the Israelites into the promised land? 6. Was exiled to the island of Patmos where he wrote Revelation? 7. Was going to curse Israel, but had to bless them? 8. Became the first King of the 10 tribes that broke away? 9. Rescued David from her foolish husband Nabal? 10. Was rebuked by Paul for refusing to eat with Gentiles? B. Where geographically did the following events take place? 11. God gave Moses the Ten Commandments? 12. A silversmith caused a riot? 13. Elijah had a confrontation with the prophets of Baal? 14. Believers were first called “Christians”? 15. The river Jesus was baptized in? 16. The walls of the city collapsed after the Israelites marched around it? 17. Jesus walked on water? 18. The place where Jonah was supposed to be going when he fled to Tarshish? 19. The place where Paul was heading when he was blinded on the road? 20. The river Ezekiel was at with the exiles when he received a vision from God? C. In which book of the Bible do you find the following? 21. Peter visits Cornelius where he learns that God accepts Jews and Gentiles? 22. Paul asks a runaway slave to be welcomed back? 23. Israel worships a golden calf made by Aaron? 24. The story of Joseph and he brothers? 25. Twelve men explore the land of Canaan, but only two trust God to give it to them? 26. God’s judgment on Israel is pictured by a prophet as horde of locusts? 28. The words “My God, my God, why have you forsaken me?” in the Old Testament? 29. A prophet marries a prostitute? 30. The Magi visiting the Christ child? D. In which book and chapter(s) do you find the following? 31. God first speaks the Ten Commandments? 32. The call of Abram? 33. The Sermon on the Mount? 35. The Holy Spirit coming upon the disciples in wind, fire, and tongues? 36. Just as Adam was the head of the old humanity, Christ is the head of the new: “Just as through the disobedience of the one man the many were made sinners, so also through the obedience of the one man the many will be made righteous”? 37. ”But these three remain: faith, hope, and love. And the greatest of these is love”? 38. A religious leader hears “Unless a man is born again he cannot enter the kingdom of heaven”? 39. Satan bound for a thousand years? 40. The three Hebrews saved from the fiery furnace? F. Who said the following? 51. If I perish, I perish. 53. After I am worn out and my master is old, will I now have this pleasure?…Will I really have a child, now that I am old? 54. O Jerusalem, Jerusalem…how often I have longed to gather your children together, as a hen gathers her chicks under her wings, but you were not willing. 55. Grant that one of these two sons of mine may sit at your right and the other at your left in the kingdom. 56. The fire and the wood are here, but where is the lamb for the burnt offering? 57. He must increase; I must decrease. 58. Am I dog that you come at me with sticks? 59. I know my Redeemer lives and that in the end he will stand upon the earth? 60. Give your servant a discerning heart to govern your people and to distinguish between right and wrong. G. If you encountered the following error, to which book would you turn for help? Choose the book that best addresses the error. Use each of the listed books only once: Genesis, Job, Song of Songs, Amos, John, 1 Corinthians, Galatians, 1 Timothy, James, Revelation. H. Arrange the following events in proper chronological order. 87. In the beginning was the Word, and the Word was with God, and the Word was God.John 1:1. J. In which Old Testament book would you find the following Messianic prophecies? Books may be used more than once. 91. The Messiah would be born in Bethlehem. 92. He would crush the head of the serpent. 93. He would come riding on a colt, the foal of a donkey. 94. Born of a virgin. 95. Came to preach good news to the poor, bind up the brokenhearted, proclaim freedom for the captives, release the prisoners from darkness, proclaim the year of the Lord’s favor and comfort all who mourn. 96. Would be a priest forever in the order of Melchizedek. 97. Would be like a sun of righteousness rising with healing in its wings. 99. Buried with the rich in his death. 100. Like a lion’s cub of the tribe of Judah. If we try to maximize grace by minimizing truth, you lose both. Jesus is full of grace and truth. A perfect harmony that both calls out the sin in us while comforting us. That rebukes us as we need, and consoles our deepest hurts. That speaks to us firmly and softly. This is Jesus. This is what we must do too. This desire to keep the full dose of truth along with the full dose of grace has led Kevin DeYoung, along with Ligon Duncan and Albert Mohler, to begin a new website with loads of resources for the essential doctrine of the inerrancy of Scripture. Click here to go there. It is very good. Book Recommendation Monday is back! From now on, I’ll be recommending one book each Monday on the blog. Do not be afraid, there are many books out there and a lot of them need never be read or picked up, BUT many of them do and that is the reason why I want to spend each Monday directing you to resources that I think will help you. Listen to an 11-part sermon series by Kevin DeYoung entitled The Doctrine of Scripture. Kevin DeYoung (MDiv, Gordon-Conwell Theological Seminary) is an author, popular blogger and conference speaker, and senior pastor at University Reformed Church in East Lansing, Michigan. 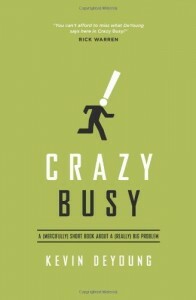 His books include Just Do Something, The Hole in Our Holiness, and Crazy Busy. He and his wife, Trisha, have six children.